The charming new compilation for preschoolers and families is set to satisfy everyone’s appetite for fun and adventure with adorable, age-appropriate escapades to engage and enchant young viewers. A colorful and contemporary CGI-animated TV series from Ludorum that reinforces early social readiness skills to help young trainees ride the rails of life, Chuggington airs daily on Disney Junior, Disney Channel’s programming block for kids ages 2-7 and their families. Wilson & The Ice Cream Fair is an irresistible new title filled with positive messages for preschoolers and we’re very excited to give fans the opportunity to enjoy this delightful collection of favorite ‘Chuggington’ episodes – just in time to celebrate the start of summer," said Erin Carter, Executive Director of Brand Marketing, Anchor Bay Entertainment. A colorful and contemporary CGI-animated TV series from Ludorum that reinforces early social readiness skills to help young trainees ride the rails of life, "Chuggington" airs daily on Disney Junior, Disney Channel’s programming block for kids ages 2-7 and their families. The all-new episodic collection stars brave trainee Wilson, who takes to the rails with lots to do: he must make a special delivery to the ice cream fair, help Frostini create a new flavor for the mayor’s banquet and, somehow, help prevent a massive ice cream meltdown on the hottest day of the year! The non-stop fun continues when Wilson and friends Brewster and Koko visit the Chuggington ice cream factory, assist with a brave rescue at the Safari Park and embark on an exciting journey to the ice caves. Alongside helpful chuggers like Old Puffer Pete, and Mtambo, the young trainees – both on screen and at home! – discover important lessons about responsibility, cooperation, paying attention, overcoming fear and more! 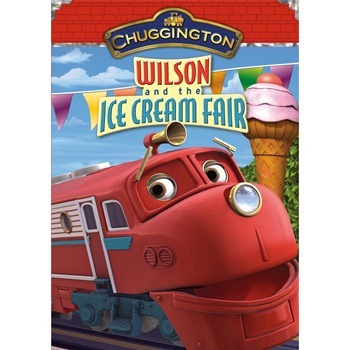 And to "sweeten the deal," two new promotional campaigns set to celebrate the release of "Wilson And The Ice Cream Fair" are sure to be the "cherry on top" for "Chuggington" fans! Starting in May 2012, LUIGI’S(R) Real Italian Ice packages will feature a coupon for $2 off on the purchase price of the new title or any other "Chuggington" DVD. In addition, consumers who purchase a "Chuggington" DVD and any Joy Cone brand 42 count Mini-Cups or 18 count Color Cups from May 1 to October 30, 2012, will be entitled to receive a FREE Frostini die-cast train from TOMY (shipping and handling charges apply). ONE OurKidsMom reader is going to win Chuggington Wilson and the Ice Cream Fair on DVD! My kids would love the wooden railway! i wud luv the wooden railway set for my kid! My daughter loves the games on their site! My four year old son loves anything involving trains. He would love this DVD. I like games on their web site. I learned that there is an official Chuggington YouTube Channel. My son loves the games and I love that there is a you tube channel. This comes on handy at the store, in the car, and if we eat outter at a place where he has to be patient for very long. I love that it tells about all the chuggers 🙂 My 4 year old loved it! my daughter loves Brewster the best! I also like Chuggington’s Wooden Railway. They have the cutest games. My sons is now asking to play! My son loves to play the games. My grandaughter just loves Chuggington. I am glad to find a site where she can play the games on and watch the videos.Thanks for sharing this information and the great giveaway. I like the Chuggington 4-in-1 Game Cube! I learned there is an official Chuggington You Tube Channel! I like the wooden railways. It may appear I’ve entered more then once but Rafflecopter kept timing out and every time I signed back in it was as if I hadn’t entered yet. Like the Board Book Set. I like the games on the Chuggington website. I like the shopping and different cute items like the cube. Book about ice cream is a good story line. I like the YouTube channel. I would love the Chuggington book sets! My kids like their games.